This week I bring you, Layne Johnson. I first spotted this talented creator from Texas on Instagram. He's quite a prolific Instagrammer. He believes art isn't something he "does" it's who he is. I like that. He says on his website, "I want my art to be a break from all the chaos and negativity." Absolutely! I agree wholeheartedly. We all need a respite from the vitriol that is so prevalent today. That's part of the reason I have this website. Though Layne produces some great portraiture, I get the feeling his heart is really with the landscape, and it shows. He wants to take his medium and transport you to a beautiful place, and for me, he does. His cloud paintings are phenomenal. His paintings give you a real sense of their overwhelming size and grandeur on the landscape. Clouds are pretty much made from the same stuff, but they can be dramatically different. Some are wispy as a breath of air, and some have such heft you wonder how they stay aloft. Clouds are constantly evolving. If you watch them long enough, you can see them changing before your eyes. They grow, evaporate, shade you from the sun, and pour down rain. They can morph from one shape to another before you know it. I love how different parts of the cloud reflect and filter light differently. 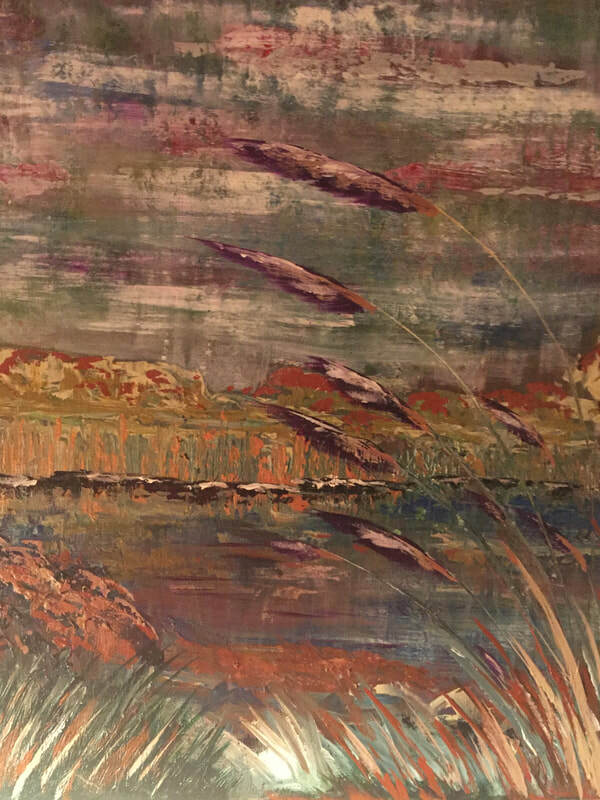 Layne captures the whole spectrum of color from nature on his canvas. He is, like many artists, a teacher. It's no good to just hold on to your talents or techniques. It's much better to spread the wealth around. If you want to learn his techniques and make beautiful art as well, you can order his online course or attend one of his in-person workshops. But, don't take my word for it. Check out Layne Johnson's work for yourself. Here's where you can find him on the interweb. I'm sure he would appreciate a visit and a like or two on social media. No go out and make some art! ​I did this painting of Latitude 18 when it was up and running. Latitude was our local hangout when we lived in Red Hook, and it was a hopping place back then with live music every night. 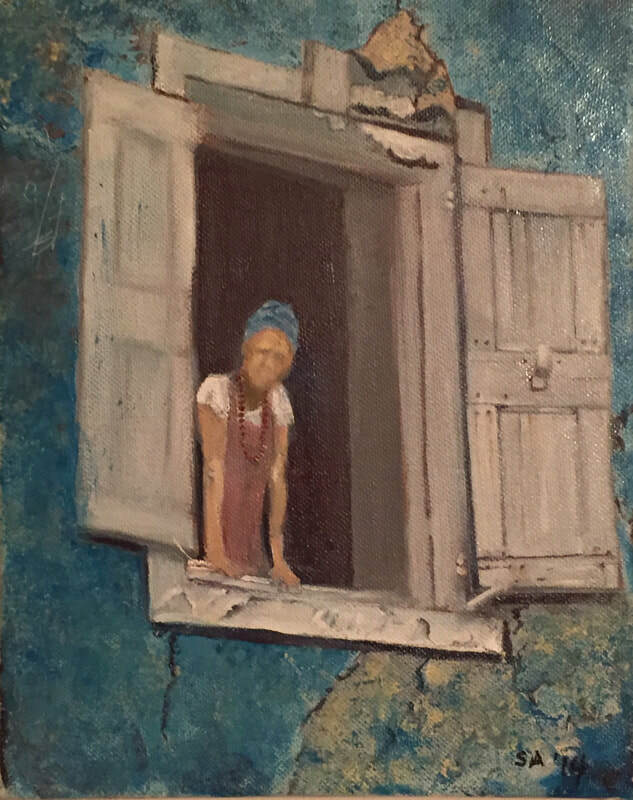 I spent some time today gazing listlessly out the window. I was taking in the fabulous colors and watching people frolicking in the bay. Every once in a while I'm overwhelmed with the beauty of the ocean around here. The waters run from deep blue to the most tantalizing turquoise and aquamarine. When the sun shines, and the breezes blow off the sea, it's bright, beautiful, and most of the time it's serenely peaceful. Sure, there is the occasional hiccup, but I don't mind most of the time. Most of the time, I've been pretty content and grateful to be here. As we're planning to leave the island in a couple of weeks, I'm getting a bit panicky because I want to redo some of my favorite things before we go. We want to visit St John and our favorite little haunt there like The Sun Dog Cafe, where lots of people gather to tip a few and have some laughs. I want to have a Pain Killer at the Beach Bar on Cruz Bay. I've heard its open for business now, so we've got to check it out. It's time for one last round of our favorite bays and beaches. We want to dip our toes in Honeymoon Bay on Water Island and perhaps relax to the smooth vibes of a local band. 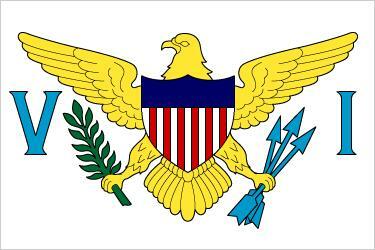 We can't leave out Hull Bay, Magens Bay, Lindquist Beach, and I can't forget Sunset Beach. I'm looking forward to visiting some of the many restaurants we've come to love: The Coconut Cove at the Ritz, The Twisted Cork in Frenchtown, Gladys' Restaurant in Charlotte Amalie, and Fresh Bistro at Yacht Haven Grande. Unfortunately, Hurricanes Irma and Maria devoured a couple of our favorite haunts. We've had to bid a fond farewell to Latitude 18 (painting above) on Vessup Beach and Epernay in Frenchtown. They have shuttered their doors permanently or quasi-permanently because of storm damage. Mahogany Run, a once picturesque golf course, was ruined by the hurricane. What was once a beautifully maintained track of land is now, well, not. Trees grow out of the bunkers and bushes are sprouting out of the greens. Yes, it's time to say goodbye to all our favorite places. On April 30th we're off on new adventures. I'll be writing my last post from St Thomas for quite some time next week. I hope I'm able to report success on our final days in paradise. Until next week, I wish you peace! Not many of the artists I recommend in this newsletter come with a warning. David Goodsell is a scientist. He's a "structural biologist." He studies the structures of cells and in particular, viruses. From his studies of these cellular structures, he creates his artwork. He makes up the colors in his painting because the proteins he's represents have no real color. So he makes up the colors to help distinguish between the different functions each of the proteins have. I think the representations are fantastic. ​The reason I think Goodsell should come with a warning is not that he represents things like HIV, the Zika Virus, and other extremely hazardous cells in his paintings. It's because the subject he's representing makes you want to dig. You can lose yourself for hours in his work. His artwork makes some very complex functions a little more understandable and accessible. If you want to find David on the internet, you can find him at Molecular Art | Molecular Science. You'll find out all about him there. Now go out and make some art! Today I'm sharing a colorful painting I did recently. I may have shared this one before, but I love its vivid colors. And just like week's artist of the week, I love colors. I'm also a bit fascinated with beta fish. 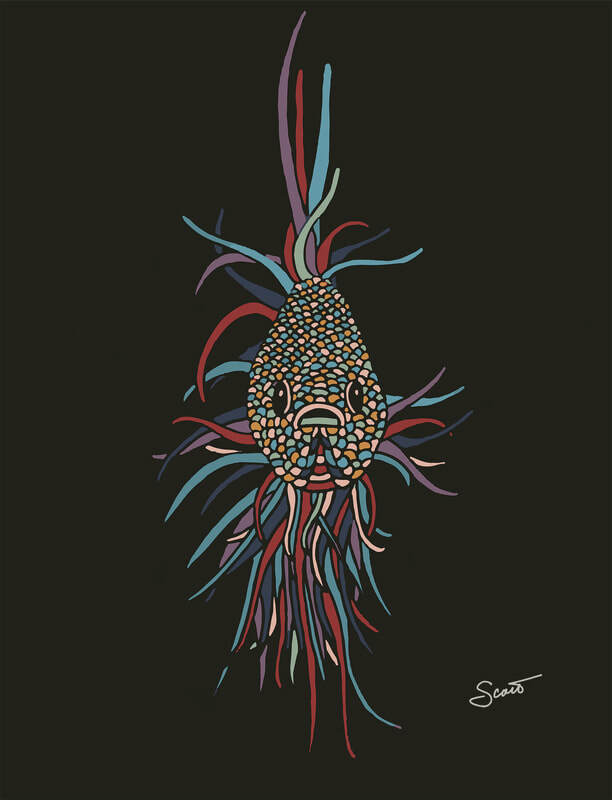 The color, their enigmatic look, and flowing fins are mysterious and mesmerizing. What, you say, they're only fish. I'm intrigued by new and unusual things. I'm even a bit adventurous sometimes. When I was in college, I kept a couple of pet snakes and some other reptiles because I was somewhat skittish around them and I didn't want to be. I got used to it though I'm still not a fan. When it comes to new technology, I'm not so adventurous. I've never been an early adopter. You won't find me standing in line to buy the latest gadget. I might admire it from afar until it's proven itself, but I'm not sticking my neck in that door until then. I wouldn't say I'm an early adopter. I find it hilarious that people who look like they can't afford dinner tomorrow will stand in line and go into debt to buy the next Apple iPhone 36 Delta Force Satellite Handheld or the Samsung SkyMaster Communicator 8600 Splash with the non-flammable battery upgrade. I hear those new "phones" can anticipate your every need. They'll start and unlock your car, or turn the lights on at home if you're afraid of the dark. You can have them order you dinner if you're too lazy to dial, buy you a drink when you need one most, or cut you off and call an Uber/Lyft when you've had too much. "I promise to pay through the nose until my nose runs dry. If I'm no longer able to pay through my nose, I'll donate an arm, a leg, or even a kidney to satisfy my need to have the next best gadget. If I run out of body parts, my children will be offered up as compensation. Should I be unable to conceive or obtain a firstborn child, I will submit to a visit from a large bald man whose thoughts barely chug along one syllable at a time, sporting iron knuckles that drag on the ground leaving a trail of fireworks reminiscent of New Year's Eve or the Fourth of July. If all collection methods fail you will self-destruct, your soul will be delivered directly to hell; you will not pass purgatory, you will not collect another phone. We will obtain the gadget by any means possible, ship it back to the manufacturer, and ensure the Secretary will disavow any knowledge of your actions. In return, you will receive something that may not have been tested or approved. We don't even know if it will cause a deathly illness or nervous compulsion. We do not stand by any of the apps that you use because they don't belong to us, nor do we guarantee the gadget will work a week from now unless you buy the near-obligatory service policy and insurance. You may not return the gadget until we determine that you need an upgrade. At such time we'll stop remotely updating your software so it will become practically unusable. At that time you will be forced to return to the store, so we tempt you with new shiny flashy things." I'm not a complete dinosaur though. I think I'm only a few versions of the iPhone behind. I've had it for hmmm - well - long enough that I don't have to pay for the phone itself anymore. I have friends who still have their flip phones and are kind of proud of it. I can't blame them. Why change something when it works for you. As for me, I bought my current phone when they stopped updating my iPhone 4. This phone was less than three years old, and the battery was giving me fits. I called up the Apple Store, and a sharp young man ran through some diagnostic tests with me. He found that my battery was getting close to kaput. It had finally tipped over the edge and was past the point of no return. I had a few choices though. 1. I could buy a new phone. I went online to see how much a new phone was. I gagged and passed out. When I came to, I remembered when you could go into Radio Shack and get a pretty cool landline for less than $15. Those were the days. 2. I could keep my phone plugged in all the time. This option defeats the purpose of having a "mobile" phone. I'd be right back to the landline scenario. I might as well call up Ma Bell and have them wire my house again. Benefit: I could use the 15 dollar phone I still have stored in the garage — phone bill, negligible. It's not impossible. I could do it. I've been phoneless before. I could rid myself of all of the iPhonalia (iPhanalia: paraphernalia tied to the upkeep and proper care of an iDevice). I don't need a phone. Most of the calls I receive, want me to buy something I don't want and can't afford with money I don't have. 4. Get a new battery. I opted for this one because, like a lot of folks, I've got used to the cool functions on my phone. Yeah, I'm a sucker. That, and I didn't want to mothball a phone I paid for over time and through the nose for. So, I went down to see the folks at my local Apple store. My Lord, these kids were barely out of high school. These cherubs were all happy and perky and oh so willing to help. I'd say they were frustratingly and irritatingly ready, and able to assist. The kids were, however, in fact, handy, and suggested I walk across the street to have a beer while they worked their magic — not a lousy waiting room. The place was called "Pies & Ales." What's not to like? A half hour later, Presto-Chango new battery. It wasn't over the top expensive. I spent 49 bucks instead of a grand, and my phone ended up being just as perky as the Apple Junior Mafia with their trendy tattoos, and their persistently patronizing smiles. I left with a smile though. My phone worked again. Maybe it was the beer. It could have just been gas. I hope when you call, I'll be ready to pick up, and my phone will be serviceable, all charged up, and ready to use. I'll be so happy to hear your voice. I ran across David Behrens on a program called "Colour In Your Life." Color in Your Life originated in Australia and was conceived by Graeme Stevenson who is an artist in his own right. David was one of the first people I saw on that show, and his style really intrigued me. It's an expressive style with bright, bold colors set against a black background. That doesn't stop him though. Looks like he'll paint on just about anything. He is very creative. He says he feels an affinity with ancient symbols and uses real and made up symbols in his works of art. The works are abstract but also representational and expressive. I love the detail and the systematic nature in the creation of his art. He has created his own style. His works are collected by people all over the world from Australia, the UK, Asia, and the United States. The Colour In Your Life program on YouTube features Behrens and his art. I think you might find it interesting; I did. His work is unique, and I love the bright colors and symbols he uses. He says that the process he uses is intuitive and just flows while he is creating his paintings. I like the way things flow with him. Whatever the process, I love the results he gets. If you want, you can visit him on any of his interweb venues. ​I like St Thomas, though you need to have a reasonably high level of discipline and perseverance to live on a tropical island. Everyday things on the island are just a little bit more difficult. You can't let things get away from you. Eternal vigilance pays off. And, every once in a while getting away is just the medicine the doctor ordered. God, is it great to get away. I get "State Side," as opposed to "The Territory," and everything is different. For one, when you get a drink in a bar, the glass is probably not half full of alcohol before they start pouring the mixer. There's a term for that on St Thomas. It's called a Stateside Pour. Yup, It's a thing. I think the reason is, mixers are more expensive than the booze there. So you've got to keep an eye on your liver. When I make it back to the mainland, I experience a bit of culture shock. Here are a few signs I've been on the island a bit too long. Do you ever get confused what about what side of the road to drive on; I hope not. You should have that down pat, but traveling back and forth from St Thomas can throw me for a bit of a loop. On the island, you drive on the left, and the steering wheel is on the left side. It's not so bad once you get used to it, but your first couple of excursions in the car can force you to engage a few dormant brain cells. It's not insurmountable, but sometimes it gives you a little bit of an uneasy feeling pulling out of a parking lot. At least, in England, the steering wheel position is commensurate with the side of the road you travel on. As I wander through the aisles of the supermarket, I look like I've just come from the third world. Everything is so bright and shiny and so new and fresh. The shelves aren't half empty because some container ship didn't come in this week. In the island some days the market will have the bread you want and some days it won't. The very next thing I notice is a gallon of milk costs a ton less than eight dollars, a half pound of butter doesn't need a second mortgage, and if I can spot a nice loaf of bread and it can be scooped up for less than $10.00, I'm liable to swoon. Stateside I smile all the time at bank tellers, supermarket cashiers, and other service people. The US is a service oriented country, and we do it well. If you've ever complained about customer service here on the mainland, stop right now. Service is so much better here. I would forgive you for qualifying the Continental United States as a different planet. The worst service in Arizona is oodles better than average service on St Thomas. There are some places on St. Thomas where the service is exceptional, but exceptional is indeed the exception, not the rule. At most places, you can hardly get the cashier to pay attention to their job if you can pry them away from their cell phones. Going to the store in Arizona or Ohio is as easy as falling off a log. I'll gladly go at the drop of a hat. I'll even volunteer with a smile as big as a kid with a humungous bowl of ice cream. We plan every shopping trip on St Thomas like a military operation. We have to prepare to go to the right store for bread. Then, the butter is less expensive at that store. The fruit is better at the Fruit Bowl but sometimes more expensive. Do we have to get gas, because the station at Coki is thirty cents cheaper per gallon than the one in town? Can I stand to go to Pueblo this week or will Plaza Extra fill me with less angst, gloom, despair, agony, or depression? Which Drug Store (Chemist) will have what I need for my prescriptions? Do we need to pick up the mail? Is the mail center open at this time? Friends are important. The people you know and you're comfortable around are few and far between. We've met a lot of tourists, and we used to try to get to know people, but they're here one day and gone the next. Building lasting relationships on the island is difficult. 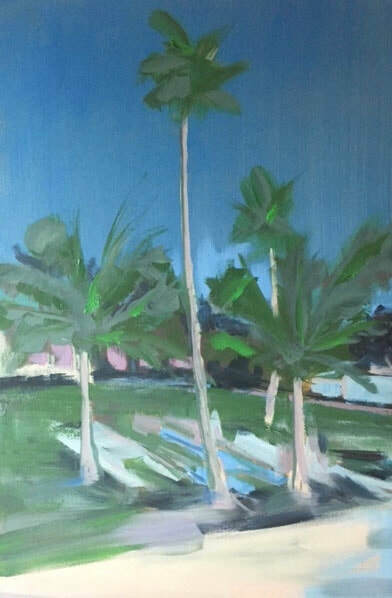 I did start to get to know some folks at the golf course, but Irma and Maria were jealous and put an end to that, and the golf course is not only closed and unkempt but up for sale. Got $42 million to invest? I like being where my friends are. I guess that's the way with most people. I know it's like that with me. I think this year is our last on St Thomas. Though I have enjoyed the experience, I'm ready to call it quits. We committed to living on the island for five years, and this is our eighth. I'll make the best of our time remaining, and I know I'll have fun, I always do. I'll lap up as much sunshine and salty air as I can, while I can, but then I will think of the Caribbean in the context of holidays rather than day after day. Fifty years ago Neil Armstrong and Buzz Aldrin took a romp on the moon. I was thinking about the astronauts who went to the moon this week. Amongst them was the fourth man to walk on the moon, Alan Bean. He retired from NASA in 1981 to pursue a career painting. I guess he figured he'd paint what he knew, so he spent the rest of his days blissfully painting that far away place he visited so long ago. I imagine he could have taken up just about anything but he decided on painting. First, there is no other painter in the world who has first hand experience with the landscape and feeling of being on the moon. 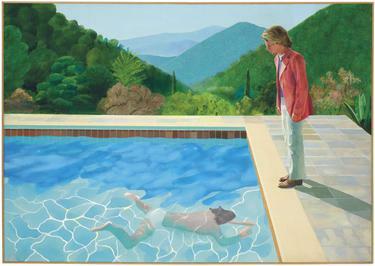 He was there, he experienced it first hand and he passes that down to all of us in his paintings. Second, because he was allowed to keep his space suit and other memorabilia like patches, he thought he would incorporate some of that moon dust he brought back in his paintings. He mixes the paint and adds a bit of magic from November 1969. Third, he used his space boots, and the hammer used to sink the flag pole in the surface of the moon to add texture to his paintings. 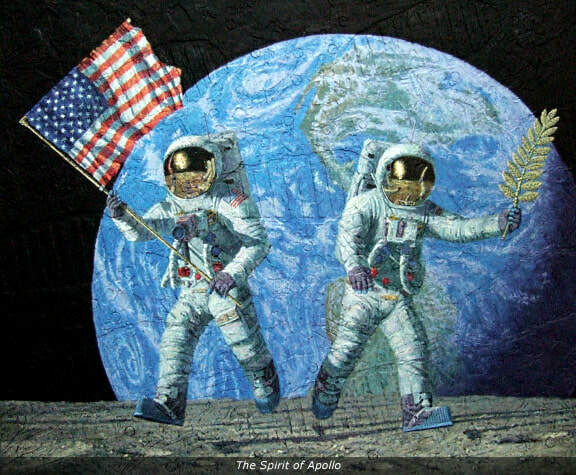 If you look closely at this painting, Spirit of Apollo, you can see the textures he added with his space boots. I suppose this was not exactly as he saw things 240 thousand miles from our front door, but it's exciting to see how he wanted to convey the experience. We owe a lot to these adventurers who took that round trip to our little grey cousin in the sky. It's motivating to see such a guy take up painting and sharing his experience and his work. If you want to read a bit more about this painting, you can visit his website and read it in the artists own words. The Spirit of Apollo. Alan Bean passed away last year and was ​interred in Arlington National Cemetery on November 8, 2018. His funeral was marked with all the attendant flourishes you would expect for such a man. Rest in Peace Alan, your work will continue to represent you long into the future. 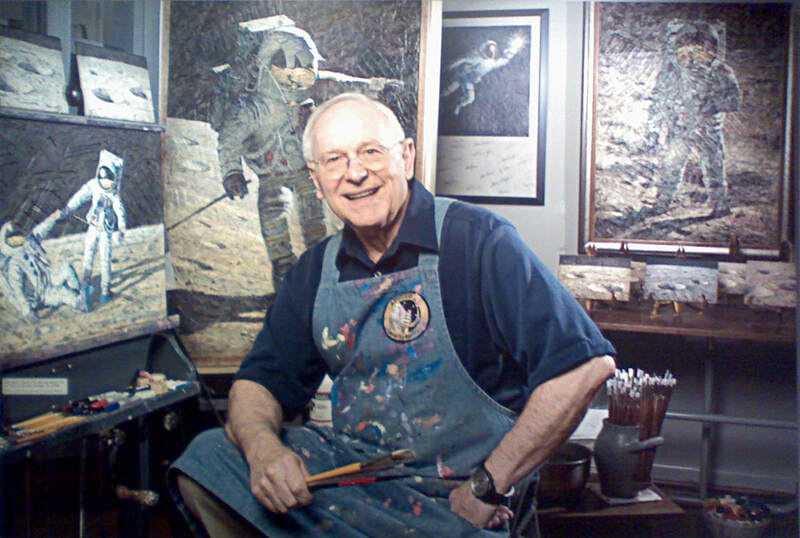 You can visit Alan Bean on Wikipedia or his Website. Now, you go out and make some art.